Cooking boneless skinless chicken breast is often thought of to be difficult but with the George Foreman Grill, it’s not only very easy, but also super delicious. This recipe for Italian Dressing Chicken Breast uses an already made marinade that you probably have in the refrigerator right now – Italian Salad Dressing. It has all the perfect ingredients for making a wonderful marinade that makes the chicken burst with flavor and tender juiciness. 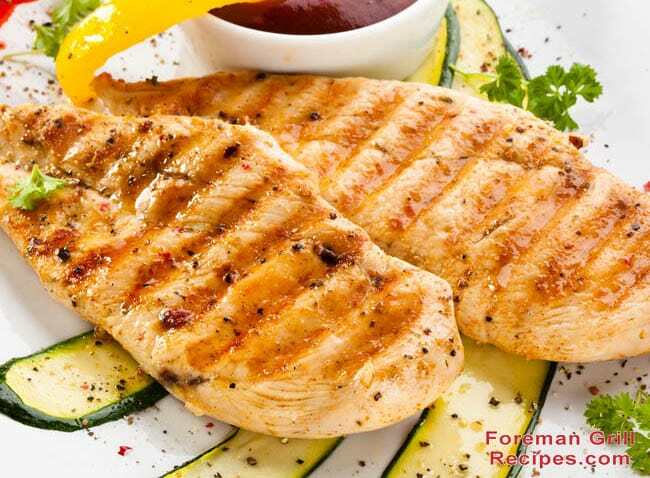 As with all chicken breast recipes on the George Foreman Grill, you’ll get the best results of you use thinner cuts of meat – 1/2″ – 3/4″ inch thickness at most. And having the meat be even thickness is very important too. Use a meat pounding mallet to pound the breasts to an even thickness. It only takes a moment and can be the difference between having tough chicken and a delicious, tender meal. Begin by pounding the breasts thin. Place chicken breasts on a paper plate, cover with plastic wrap, and use meat pounding mallet to pound to 1/2″ even thickness. If you do not have a meat mallet, use a for and pierce the breasts several times, especially on the thickest parts. Place chicken in a plastic zip bag with dressing and let sit overnight, or at least for a couple of hours. Preheat your George Foreman Grill for at least 5 minutes with the lid closed. Use ‘high’ setting if your grill has it. Place chicken on grill and close lid and let grill for a 5 minutes. Check for doneness. You do NOT want any pink in the middle. An average 6oz chicken breast of 3/4? thick will take 4-6 minutes. Internal temperature should be 165 degrees. Ok, so what if you use one of those store bought pre-made marinades? Do you need to pat it dry before putting it on the grill? Also, do you need to let it come up to room temperature before actually grilling? Every time I use it my chicken is tough and all of the marinade is burnt/black/crisp on the outside of the chicken. I can’t seem to figure out the tricks to make sure a marinated chicken is still juicy and tender when using a George Foreman Grill. A good rule to know is that anything with sugar burns quickly. Most marinades will have sugar in them. It is always best to make sure you rinse and pat dry your meat. Water will also causing burning and it splatters. When your meat is close to being done you can baste it and let it cook for just a few seconds. Marinating gets the flavor in the meat internally so you are not losing flavor by rinsing and drying. Thank you so much, Amber Earnshaw! That is a huge help! Ive only used my foreman grill a few times because I have been SO frustrated with the burned mess! So, did you have better success when you tried this, Alissa? I want to try this too, but is love to hear if it made the chicken better. I think patting the meat dry only removes some of the moisture you need. You do want the sear marks. Most make the mistake of cooking too long on high heat. You don’t need a long time on high heat when the chicken has been marinaded hours to days and a grill that cook on both sides at one time. Use olive oil or canola dabbed on a paper towel or you can use Italian marinade it has oil in it and wipe down the grill plates then preheat high for 5 minutes.. Don’t use anything like Pam its a high burning “oil” and burns the chicken before done. You want a low burning oil. Also most people cook chicken too long for fear of food poisoning. However if you are grilling on high heat in a preheated grill you don’t need 10 minutes or more, I cook for 4 minutes lift the grill lid and base with marinade then cook another 4 to 6 minutes no more then 8 minutes total. Then wrap breast in foil after dabbing more marinade and put in a preheat oven on about 200 or warming setting and it will finish cooking in it’s own heat and stay moist leaving it warm when you serve it gives you the chance to work on sides, setting the tables or get dressed before your guest arrive. I also add 1 to 2 tbsp of liquid smoke to my marinade. I just cooked some chicken on a foreman-type grill, I just let it heat, stick the marinated chicken breasts in, as many as will fit, and make sure they stay moist. In other words, don’t let it sit in there too long, all you gotta do is get rid of the pink. Usually takes about 4 minutes a side. I just flip em to make sure the drippings coat both sides evenly. It came out as good as any chicken breast I’ve gotten at a restaurant.